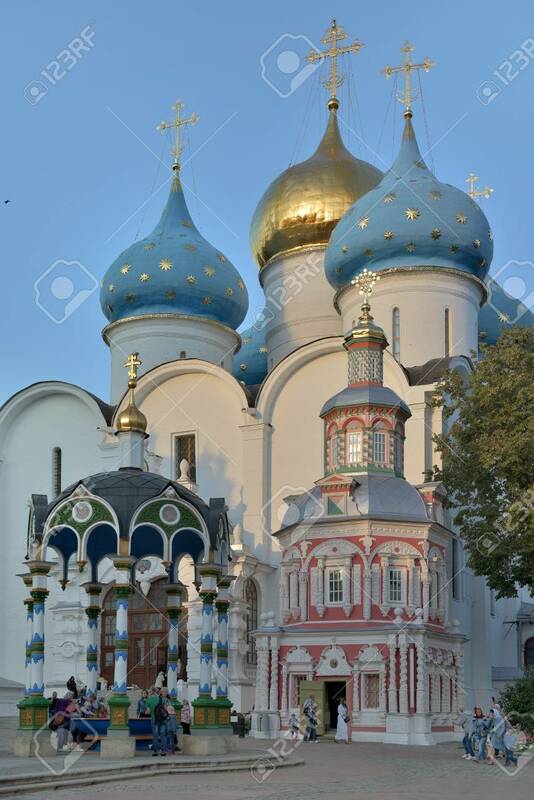 Sergiev Posad, Russia - August 29, 2015: The Cathedral Of The Holy Trinity St. Sergius Lavra. The Shrine Of All Christians. The Center Of Pilgrimage Of The Christian World. Sergiyev Posad Is Included Into The Golden Ring Of Russia. Фотография, картинки, изображения и сток-фотография без роялти. Image 62936054. Фото со стока - Sergiev Posad, Russia - August 29, 2015: the Cathedral of the Holy Trinity St. Sergius Lavra. The Shrine of all Christians. The center of pilgrimage of the Christian world. Sergiyev Posad is included into the Golden ring of Russia. Sergiev Posad, Russia - August 29, 2015: the Cathedral of the Holy Trinity St. Sergius Lavra. The Shrine of all Christians. The center of pilgrimage of the Christian world. Sergiyev Posad is included into the Golden ring of Russia.